Maia is the Goddess for whom the month of May is named. Various meanings of her name are *grandmother*, *midwife*, *wise one*, *She Who is Great*. In Rome, she was also known as “Maia Maiestas”, meaning “Maia the Majestic”. While much of Her story has been forgotten, there are a few things we do know about Her. She was the eldest daughter of Atlas and Pleione, the oldest of what came to be known as the Pleiades; as such, in Greece, She was also called the Goddess of the Night Sky. 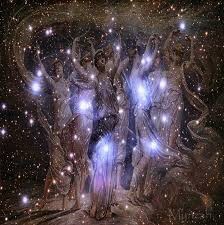 The Pleiades were the 7 Sisters who were nymphs in the company of emis. Their name became the name of the 7 star-cluster constellation in our night sky. They were born in a cave on Mount Cyllene, where Maia continued to live, quite secluded. Apparently, she was not quite secluded enough as Zeus found her, and in due course, She gave birth to Hermes, the Messenger of the Gods. She is sometimes called the *Grandmother of Magic*, as it is said (but highly doubtful) that Hermes invented magic. Maia was also given Arcas, Zeus’ son by Callisto, to raise as Callisto was turned into a bear by the Goddess Hera, who was ever jealous of Zeus’ extra-marital relationships. honored in Rome in the month of August at August Volcanalia, a festival to ward off fires that were caused by the dry weather and extreme heat that could destroy the harvest. 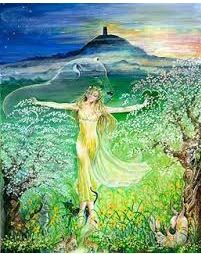 She was celebrated as the Goddess of Spring, welcoming in the renewal and rebirth of the new season, shedding the death of winter. 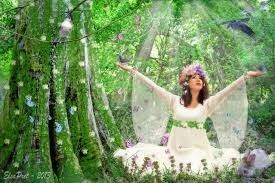 She represented growth and fertility and was honored with an abundance of flowers at her festival on May 1st. This festival was eventually changed to honor Mary as the Queen of Flowers, but it will always belong to Maia. In both Greek and Roman cultures, Maia was strongly identified with Mother Earth, who in Greek was Gaia to the Roman Terra. She was also identified with Bona Dea, The Good Goddess. May all the joys of Spring be yours!